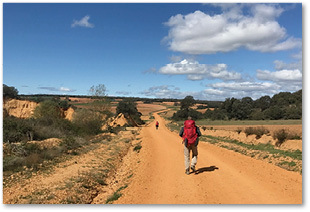 The Camino de Santiago, known in English as the Way of Saint James, is a network of pilgrimages dating back to the beginning of the 9th century that leads to the shrine of the apostle Saint James the Great in northwestern Spain. About half way through my hike I met a French girl named Blandine who had just finished nursing school in her hometown of Lyon, France. The language barrier between us unfortunately limited our conversation, but after a couple of hours of hiking together we discovered a mutual love for the Catholic Church. Later, we were passing through one of the many small towns along the Camino and stumbled upon a little Catholic church. Prior to my trip, a priest had suggested that I dedicate each church I visited to someone back home, and so I asked Blandine if she would like to make a quick stop. As we stepped into the stone church, Blandine, with her heavy French accent asked, “I sit?” Confused about why she asked, I answered yes and went on with my business by kneeling in one of the pews. As I opened up in prayer, I suddenly began to feel this gloomy, chamber-like church come to life with the most astoundingly beautiful voice harmonizing “Ave Maria.” In awe, I turned around and suddenly realized that Blandine had not asked me if she could sit but if she could sing. I will never forget that day on the Camino, because I think it is the day that I met a saint. The truth is, I wanted any other answer than “starting work.” What I really wanted was time to reflect on who I was and what it was that I had to offer to the working world that was inevitably before me. I knew that I wanted to get out of my comfort zone, and I was determined to achieve something that at first seemed unimaginable. From that realization, the idea of hiking the Camino started to resurface in my mind. As I started to pray about it, I immediately felt that God had an opportunity waiting for me on that trail, one that I could not come to understand unless I set off to find it myself. I realized that I wanted the Camino to be a battle and an adventure, but in (in a book I read prior to leaving) I learned that there was something far greater that God wanted me to pursue on this trail, an elusive something that can only be found through the help of getting lost in his creation. God wanted me to go find my own heart. I believe that with every moment, whether it is filled with joy or with tribulation, God is trying to speak to us. Although we sometimes can’t feel or hear it, God is continuously knocking at the door of our hearts asking us to let ourselves be loved by him even more. I believe that it took God pushing me out of my comfort zone and everyday routine to see all that I was missing. With work, family, friends and so many other daily obligations, our culture quietly makes it dangerously easy to marginalize our daily time spent with the Lord until it is altogether nonexistent. I quickly realized that in my relationship with him, I had done all of the talking, and that it was time for me to do some listening. The Camino brought daily solitude through early morning hiking that really allowed me to dig deep into my roots. The winding path of wondrous mountains and desolate valleys provided me with a deeper understanding of both God’s sovereignty and the peace found in simplicity. The trials and exciting moments that came with the Camino gave me time to reflect on all the joyous and sorrowful moments of my life and to recognize how he was using those moments to work through me. Furthermore, the Camino gave me a battle that I regretfully had asked for: a battle of my feet. Like any walk of faith, I believe that God used my feet to break me down both physically and mentally to the point where I had to rely on him like never before. God wanted to teach me the true meaning of perseverance, through the blistering and swelling of my feet. During mountain ascents, he taught me that at times life can be an uphill battle, and that he calls us to fight nonetheless. I learned that there is never a moment in this journey of life that we ever travel alone. When I reflect on my journey, one life-changing lesson never ceases to come to mind: God waits to be wanted. God is constantly waiting for us to take the time to put the world aside and make him our main priority. So whether it is the Camino or something entirely less extreme, there is a closed door in your life that God is perpetually knocking at. Open it, and see what Camino God has waiting for you. 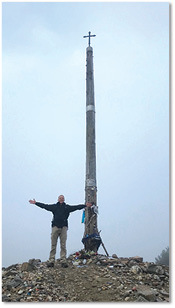 Michael Hilborn hiking the nearly 500-mile Camino de Santiago trail.